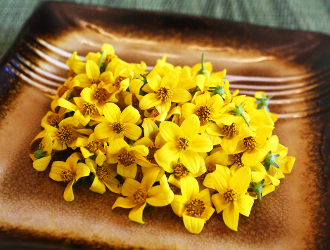 Vibrant yellow tiny 5-petaled flowers resembling daisies. Add a splash of color to gourmet green salads, hors d'œuvres, or fish entrees. It's mild flavor makes it extremely versatile. Also a wonderful floating garnish for a specialty cocktail. Classy addition to petite desserts. About the size of a nickel.